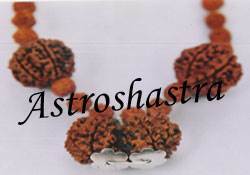 An auspicious mala of Gaurishanker Rudraksh surrounded by one bead of nine mukhi and one bead of eleven mukhi. 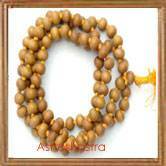 This energised mala is one of the powerful mala. 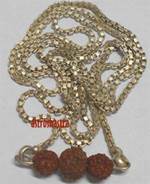 Nine Muhki Rudraksh is auspicious for spritual attainments, wealth, property and other wordly affairs and Eleven Mukhi Rudraksh is worn for attainment of popularity , strength and wordly comforts. 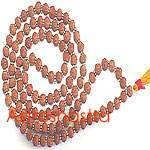 Gauri Shanker Rudraksh bestows the family bliss i.e. love and co-ordination between couples. 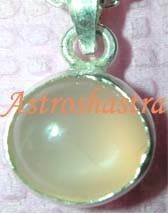 This energised power pendant is recommended for all for material and spritual attainments. 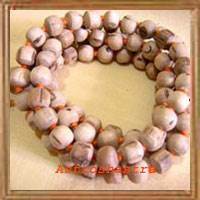 Anyone can wear this mala and you would feel the difference within youself.